My family lives in London….I would have been in that queue if not for university….stoopid education! What followed was a 7 year waiting game, I’d be ready by the time the PS4 rolled round, I wasn’t going to miss out again. Unfortunately, the PS4 launched with little fanfare from UK vendors and though meeting fellow gamers in the November cold of Oxford street was fun, my lack of a new TV or even something small like a Nathan Drake plushie stung more the the biting wind that buffeted me for the 3 hours I waited. Obviously this isn’t in reference to every big blockbuster game but it seems to me that this year’s most anticipated ventures failed to live up to expectations. It all started with launch titles such as PS4’s Knack and X1’s Ryse: Son of Rome both games which showed off what the new machines could do visually and in terms or processing power but fell well short in terms of fun factor. This is to be expected though, launch titles are very rarely masterpieces (put your hand down ‘Halo’ – we see you) and we did had some fun options available with the likes of Killzone: Shadow Fall‘ and Dead Rising 3. It was the later releases which were much more of a concern. Watchdogs which my friends and I were salivating over for the longest time proved to be shallow and bland. The story was deeply uninteresting as was the main character and the mechanics were just a poor man’s GTA with a flighty hack system thrown on top. It wasn’t a bad game, it just firmly planted its marker in average land. The next biggest disappointment was the highly touted Destiny, Bungie’s attempt to have lighting strike twice and capture the magic for another franchise. The shooting mechanics were good and multiplayer engaging but levels were big and empty and objectives were horribly repetitive. As soon as something new and shiny came along I put ‘Destiny’ back in its box and have yet to go back to it. Even the yearly stalwarts started to drag in terms of drawing interest. Call of Duty: Advanced Warfare is a decent, engaging game and a lot of fun to play but it’s hardly the big re-vitalising revamp of COD that we were promised. A boost jump is good Sledgehammer but not enough to hang your hat on. COD is another example of perfectly enjoyable but ultimately forgettable game which seemed to be the modus operandi this year. I can see myself ignoring it completely once Dragon Age: Inquisition hits stores. Finally, though I’ve yet to play it myself thanks to some troubling bugs that have cropped up at launch, the reviews of Assassin’s Creed: Unity give the impression of distinct average-ness. We’re gonna see sequels to all these games again within 18 – 24 months so lets hope by then that developers are a lot more comfortable programming for these new systems and can start to deliver the real groundbreaking games that these franchises deserve. It’s not hard to imagine that with the advent of new systems and the weight of fan expectation, pressure got to the developers and they ran out of time to make the games they wanted, just looking at the number of games that have been delayed in recent months there’s a suggestion that the workflow between developer and publisher is pretty off at the moment. Hopefully, if all that can be corrected and pressure taken off somewhat, creativity will flow and the slew of yearly 3rd party releases will improve. Watch Dogs: Biggest disappointment of the year? While the hotly anticipated titles were a bit of a letdown, it was the under the radar stuff that was a pleasant surprise. My most enjoyable experiences this year came from titles I picked up on a hunch or through positive word of mouth. Wolfenstein: The New Order was meaty and engrossing with a tongue in cheek story that really powered me through the campaign. The sheer polish of that game makes me dead keen to try out the developer’s next project: the new Doom coming to our consoles next year. Shadow Of Mordor was another under the radar title that had me completely hooked and gave me 30 beautiful hours at the end of which I walked away with a shiny new platinum trophy. Right up until launch many were calling it an Assassin’s Creed rip-off which lifted it’s fighting system straight from the Arkham games. True, it may be derivative of those famous titles but it iterates upon them masterfully and you’re left with a really tight, enjoyable game. Alongside these Alien: Isolation has bucked the trend of rubbish Alien games and Sunset Overdrive has proven X1 execs wise in backing the right horse. Perhaps it was the fact that these games didn’t have the expectation of the more well known titles that the developers could relax and focus on what actually makes a game good. In any case, I’m glad these games were around because they justified my choice of getting a next-gen console so early. 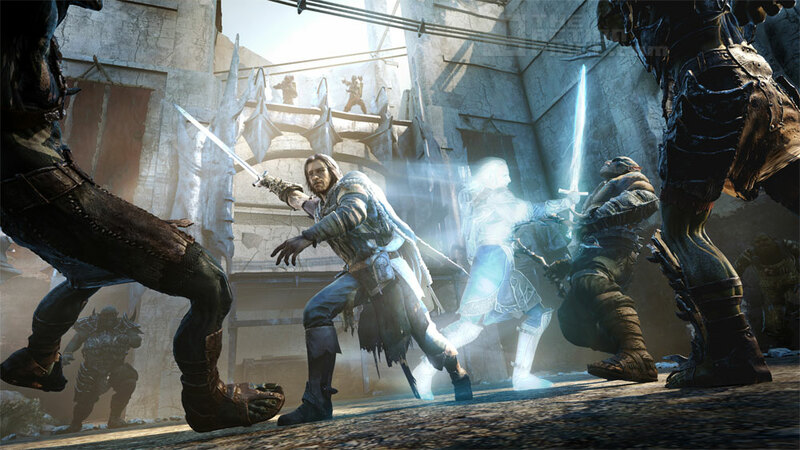 Shadow Of Mordor: Contender for Game of The Year? When looking back in 20 years time, the subtitle that will go with this generation of consoles will surely be ‘when Indie Games came to the fore’. I’ve never been much of a PC gamer. In my mind PC gaming reached its zenith with Theme Hospital, so anything released after that masterpiece will surely be a disappointment…right? Anyway, I’ve been glued to my consoles for so long that I haven’t really had much of a chance to try out the rich library of smaller games out there that are beautiful in their own right but don’t tick the boxes for publisher distribution. Well, Sony has led the charge this generation and Xbox has followed suit and now both systems are seeing a plethora of indie titles available through their digital stores. Nowadays, before settling in to a few hours of my favourite blockbuster game of an evening, i’ll have a little half hour go at a beautifully constructed indie title. Though these games are usually a few hour long, or simple hi-score chasing affairs they have amazing production values and are brimful of love and care. Truth be told some of my favourite experiences this year have been the smaller games. Child Of Light was a wonderfully art directed RPG with a rock solid encounter system and enjoyable, fairytale story. Though I found the rhyming dialogue annoying in places, the rest of the game was so wonderfully constructed I couldn’t help but fall in love with it. Stick It To The Man made its console debut this year and the 2D puzzle platformer had attitude in spades. The cardboard cut out style world it created was stock full of lovable wise-guy characters, slick dialogue and the unexpectedly fun ability to read any characters’ thoughts. I hope that there will be sequels to both this and Child Of Light one day and that someone will put a bit more support behind these projects so the developers can realise a bigger vision while hopefully keeping the fundamentals of what made their original games so great. 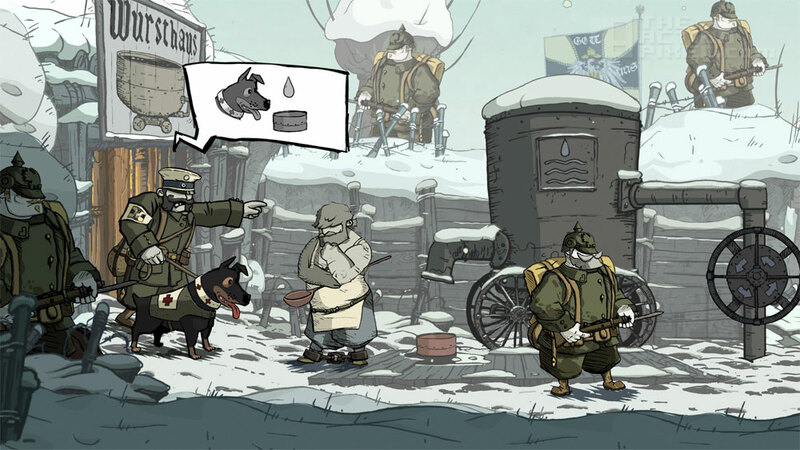 Finally, and to many the biggest indie success of the year, was 2D puzzler Valiant Hearts: The Great War. Centered around a sometimes unrealistic but ultimately tragic story of individuals fighting in World War One, Valiant Hearts was in turns addictive and fun while being a real tearjerker at the end of the story. Its cartoon style was somehow quite fitting in giving off the scope of tragic loss this conflict entailed and if you haven’t given it a go…find your nearest system and plug it in. It’ll be well worth it. Valiant Hearts: The Great War. “One Word: Beautiful”. Everything in my life is becoming subscription based. I pay monthly for my house, my car, the public transport I use, my phone, and even the cinema. As of November 2013 this list of services now includes my Playstation. As a gaming blogger i’d say I’m pretty in tune with my gaming but even I can’t tell you exactly what my PS Plus subscription covers. From what I can tell its…umm…everything. I know I wouldn’t be able to use multiplayer on a lot of my games if I didn’t have this subscription and I’m fairly sure a LOT of additional content would be blocked off too. Now, as a Playstation gamer I didn’t think Sony would ever go down this route; it was for Microsoft to try and rip off its customers and charge for things like used games and multi-player, but I guess the reality of the industry finally took hold and Sony started charging for additional services too. Now this should have caused a massive backlash, paying £400 – £500 for a new console and then being slapped with a yearly subscription on top of that is surely an outrage but the savvy console bosses assuaged people’s anger by offering free games with every subscription and not just shovelware either; genuinely good, critically acclaimed, free games. Though I’m really paying for Sony to keep it’s multiplayer servers on and PSN running *ahem* smoothly, all I can think of is that I’m getting the best deal in the world – two free games a month for something like £40 a year. I’ve merrily played Resogun, Stick it To The Man, Spelunky, and Trine 2 to name a few of the free games on offer and as of next month we’re gonna starting to see Triple A releases come out too with the excellent Injustice: Gods Among Us headlining December’s Playstation offering. So yeah, we have to swallow the bitter pill of subscriptions for our console gaming…but honestly who cares as long as these excellent array of games keeps coming. I’m not usually a periphery sorta guy. As a console gamer even a keyboard and mouse is a bit much, but one of the aspects of the new generation of consoles that really excited me when they were first announced was companion apps for games that would play through your Vita for PS4 or smart glass for X1. The possibilities of having a little second screen beside you that could be used for a range of options in the year’s biggest games was utterly tantalising but as with similar endeavours in the past nothing materialised from it. I can understand the reluctance from developers: not every PS4 owner will have a VITA nor will everyone want to play with a second screen beside them so you can’t make these apps an integral part of the game. It’d be a complex conceptual and development process to make these apps tie into the game proper and if so few people are able to experience it, why bother? I mean come on, everyone that owns a Wii U has a little second screen in their gamepad and Nintendo Devs are struggling to make use of it so what chance do Sony and Microsoft have? What companion apps we do get have been low spec affairs that go through your phone and it bugs me that there isn’t more of a push to get more complex software out with the bigger games. So those were my highlights from this generation’s launch year and I must say it’s been a mixed bag. The range of big name games wasn’t spectacular but the indie titles filled the gaps nicely and the consoles themselves are pretty awesome (yaaaay free games!). What this year does prove is that console gaming is still going strong and the line up of upcoming titles is gonna make 2015 even better. If you’re a casual gamer deciding when to invest in this generation now is probably not the time, but by this time next year I think both PS4 and X1 will have a strong enough library that every type of gamer will have a few options on the table. Here’s to another generation of high quality gaming! “Alien: Blackout” brings the xenomorph to the MMO stage.